Treatment of severe acute asthma (status asthmaticus) and also forms of bronchospasm in adults & children. It is also effective in children >18 months. By Intermittent Administration : Adult : Sultolin® Respirator Solution 0.5-1.0 ml should be diluted to final volume of 2.0-4.0 ml with normal saline for injection. The resulting solution is inhaled from a suitably driven nebulizer until aerosol generation ceases. Should take about 10 minutes. Sultolin® Respirator Solution may be used undiluted for intermittent administration. For this 2.0 ml of the solution is placed in the nebulizer and the patient allowed to inhale until bronchodilatation is achieved. This usually takes 3-5 minutes. Children under 12 years age: 0.5 ml of the solution diluted to 2.0-4.0 ml with normal saline. Intermittent treatment may be repeated four times a day. 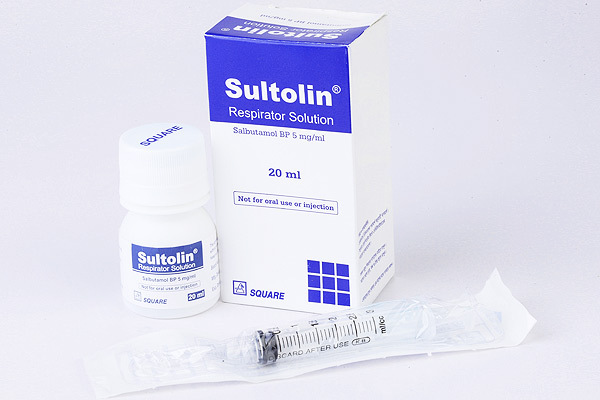 By Continuous Administration : Sultolin® Respirator Solution is diluted with normal saline for injection, 1-2 ml solution made upto 100 ml with diluent. The diluted solution is administered as an aerosol by a suitably driven nebulizer. The usual rate of administration is 1-2 mg/hour. Sultolin® Respirator Solution: Each bottle contains 20 ml respirator Solution.